Culvert is defined as a tunnel structure constructed under roadways or railways to provide cross drainage or to take electrical or other cables from one side to other. It is totally enclosed by soil or ground. Pipe culvert, box culvert and arch culvert are the common types used under roadways and railways. The design of culvert is based on hydraulic, water surface elevation, and roadway height and other conditions. These are used for water flow in a controlled way. In most cases concrete culverts are preferred. Concrete culverts may be reinforced or non-reinforced. In some cases culverts are constructed in site called cast in situ culverts. 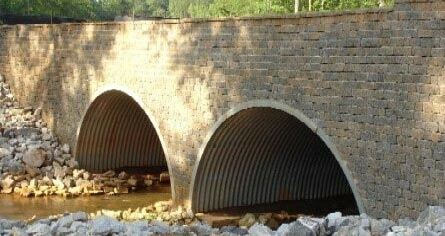 Precast culverts are also available. By the combination above materials we can also get composite culvert types. The location of culverts should be based on economy and usage. Generally it is recommended that the provision of culverts under roadway or railway are economical. There is no need to construct separate embankment or anything for providing culverts. The provided culverts should be perpendicular to the roadway. It should be of greater dimensions to allow maximum water level and should be located in such a way that flow should be easily done. It is possible by providing required gradient. Pipe culverts are widely used culverts and rounded in shape. The culverts may be of single in number or multiple. If single pipe culvert is used then larger diameter culvert is installed. If the width of channel is greater than we will go for multiple pipe culverts. They are suitable for larger flows very well. The diameter of pipe culverts ranges from 1 meter to 6m. These are made of concrete or steel etc.. Pipe arch culverts means nothing but they looks like half circle shaped culverts. Pipe arch culverts are suitable for larger water flows but the flow should be stable. Because of arch shape fishes or sewage in the drainage easily carried to the outlet without stocking at the inlet or bottom of channel. This type of culverts can also be provided in multiple numbers based on the requirement. They also enhance beautiful appearance. Box culverts are in rectangular shape and generally constructed by concrete. Reinforcement is also provided in the construction of box culvert. These are used to dispose rain water. So, these are not useful in the dry period. They can also be used as passages to cross the rail or roadway during dry periods for animals etc. Because of sharp corners these are not suitable for larger velocity. Box culverts can also be provided in multiple numbers. Arch culvert is similar to pipe arch culvert but in this case an artificial floor is provided below the arch. For narrow passages it is widely used. The artificial floor is made of concrete and arch also made of concrete. Steel arch culverts are also available but very expensive. Bridge culverts are provided on canals or rivers and also used as road bridges for vehicles. For this culverts a foundation is laid under the ground surface. A series of culverts are laid and pavement surface is laid on top this series of culverts. Generally these are rectangular shaped culverts these can replace the box culverts if artificial floor is not necessary.